into England in 1941. (A 22nd defendant - Martin Bormann - had escaped capture and was tried in absentia). Each defendant was accused of one or more of four charges: conspiracy to commit crimes alleged in other counts; crimes against peace; war crimes; or crimes against humanity. Specific charges included the murder of over 6 million Jews, pursuing an aggressive war, the brutality of the concentration camps and the use of slave labor. The judges represented the major victors in the war in Europe - Britain, France, the Soviet Union and the United States. The defendants all proclaimed their innocence, many declaring that they were just following orders or questioning the authority of the court to pass judgment. The verdicts were announced on October 1, 1946. Eighteen of the defendants were found guilty while three were acquitted. Eleven of the guilty were sentenced to death by hanging, the remainder received prison sentences ranging from 10 years to life. Goering came down first and strode into his cell, his face pale and frozen, his eyes popping. 'Death!' he said as he dropped on the cot and reached for a book. His hands were trembling in spite of his attempt to be nonchalant. His eyes were moist and he was panting, fighting back an emotional breakdown. He asked me in an unsteady voice to leave him alone for a while. When Goering collected himself enough to talk, he said that he had naturally expected the death penalty, and was glad that he had not gotten a life sentence, because those who are sentenced to life imprisonment never become martyrs. But there wasn't any of the old confident bravado in his voice. Goering seems to realize, at last, that there is nothing funny about death, when you're the one who is going to die. Hess strutted in, laughing nervously, and said that he had not even been listening, so he did not know what the sentence was and what was more, he didn't care. As the guard unlocked his handcuffs, he asked why he had been handcuffed and Goering had not. I said it was probably an oversight with the first prisoner. Ribbentrop wandered in, aghast, and started to walk around the cell in a daze, whispering, 'Death!-Death! Now I won't be able to write my beautiful memoirs. Tsk! Tsk! So much hatred! Tsk! tsk!' Then he sat down, a completely broken man, and stared into space. . .
Keitel was already in his cell, his back to the door, when I entered. He wheeled around and snapped to attention at the far end of the cell, his fists clenched and arms rigid, horror in his eyes. 'Death-by hanging!' he announced his voice hoarse with intense shame. 'That, at least, I thought I would be spared. I don't blame you for standing at a distance from a man sentenced to death by hanging. I understand that perfectly. But I am still the same as before. - If you will please only - visit me sometimes in these last days.' I said I would. Speer laughed nervously. 'Twenty years. Well; that's fair enough. They couldn't have given me a lighter sentence, considering the facts, and I can't complain. I said the sentences must be severe, and I admitted my share of the guilt, so it would be ridiculous if I complained about the punishment.' 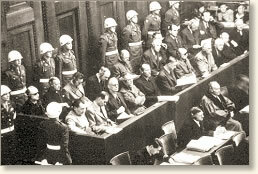 "
Although this was the most prominent trial, there were 11 other trials of Nazi war criminals held in Nuremberg between 1945 and 1949.